Canada is renowned for its heavy snowfall over prolonged periods of time, usually from around October until March, and has since become one of the popular choices for winter sports, most notably Whistler. Although it wasn’t all about skiing and snowboarding for Whistler, originally tourists would go there for fishing in the summer. When the winter came around in 1960, A group of Vancouver businessmen had a dream: To host the 1968 Winter Olympic Games, but first they had the aim of developing an alpine ski area in London Mountain, but it was later renamed as Whistler Mountain, so-called because of a local alpine marmot, that whistles when it communicates. Blackcomb Mountain opened in 1980 and featured 5 triple chairs and an additional 4260ft of skiing. Then in 1997 the owners of both mountain resorts merged. 50 years later since the Vancouver businessmen had that Olympic dream, it was finally realised and now it has evolved to a four season resort, plays host to festivals and has now become one of the most sought after locations for that alpine skiing experience. 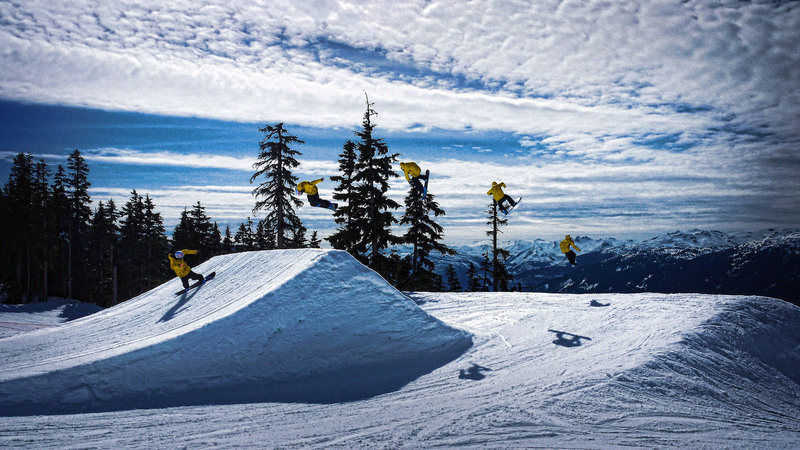 Whistler Blackcomb is a combination of the two mountains that exist parallel to each other. It has won many awards such as the Golden Eagle Award for overall environmental excellence by the National Ski Areas Association (NSAA), and has the honour of being named one of Canada’s Greenest Employers for three consecutive years. Ever tried alpine dining? You can enjoy fresh cuisine atop of mountains and a glorious view. Whether the season, you are sure to have an enthralling and unforgettable experience. Leave your Nintendo Wii at home; the Nintendo Terrain parks are full of features, from techy jibs, Snowcross and pipes. Don’t worry about falling off and landing in a bunch of trees and getting caught on camera, there are ski lessons available for children aged 8 – 13. There are also advanced ski and snowboard lessons for teenagers, don’t worry adults, they don’t expect you to start at the deep end, there are lessons for you also ranging from levels 1-6. All this and a lot more at Canada’s award winning winter resort. In 1965, Hans Gmoser, an Austrian, immigrated to Canada. It was here that he had the wildest idea: To use helicopters to transport skiers in to the mountains. This was never done before and it became known as heli-skiing. He created a company, Canadian Mountain Holidays (CMH) and has become the world’s largest heli-skiing company and has spread out to 11 different lodges. After conquering those mountains, kick back in a Jacuzzi, sauna, and great food prepared by world class chefs and pastry specialists. The Banff Ski Resort might be the friendliest places you may ever come across in Canada. Ski fanatics of all skill levels will find themselves in their own element here once they find themselves surrounded in the heart of the Canadian Rockies – you can even have a wedding with a unique twist – make your vows in the Fairmount Chateau Lake Louise or Fairmount Banff Springs then ski down the aisle as husband & wife! The activities are limitless, plus great nightlife, this has ‘winner’ written all over it. For that perfect relaxation and breathtaking views of the Surrounding Rocky Mountains, and record snowfall, you might want to try Lake Louise, if you come here at pack everything apart from your camera, you might as well turn back! This place has got it all, jaw-dropping scenery, roaming wildlife, a local shopping mall, you can even try your hand in ice skating. If you catch the offers you can get free night skiing up Mount Norquay. If you somehow missed the opportunity to check for Whistler Blackcomb for the ultimate snowboarding experience, all is not lost. Consider the Big White as Canada’s best kept secret located in the Okanagan Valley, 45 min from the large town of Kelowna; the Big White is so-called because it is one of the largest skate parks covered in snow and trees, and this makes for the most free rides, freestyles and pistes, plus a cool snowboarding course to boot. The lift system is great; visitors can disperse around the mountain while maintaining the slopes to remain clear even in its busiest periods. Arguably the best in ski resorts according to industry specialists, the Mont Tremblant in Montreal could well be the most popular among tourists, with many high-end stores in the village. Here you can become one with the other well dressed people in the village, provided you got that cash. On average just over 12 ft of snow will fall each year, then there is a powerful snow making system that needles and threads the rest. Then ski down 650 acres of terrain, and experience drops up to 2116ft. The sights in the summer are just as glorious and blissful as they are in the winter. Features such as golfing, a panoramic view of the mountain gondola and horseback riding keep the visitors coming, but not nearly as much as the winter months. With these top resorts, it just shows that Canada remains one of the most beautiful, stress-free countries in the world, and makes braving the snow equally as beautiful.